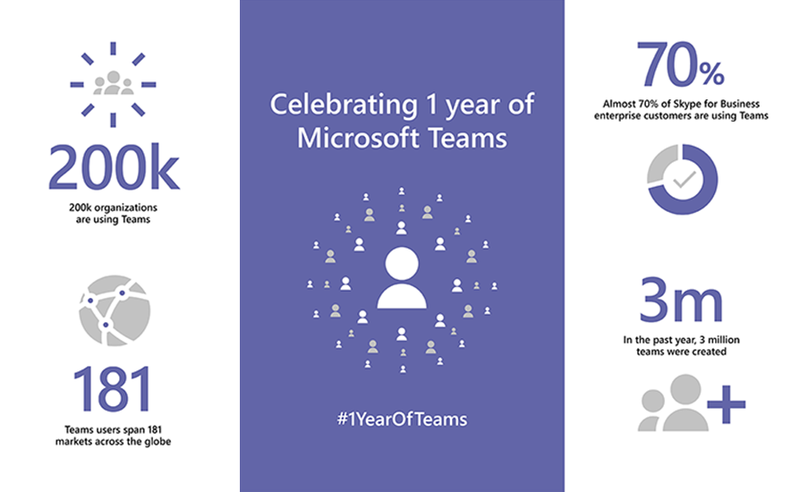 Microsoft Teams Turns One! – CT Link Systems, Inc.
On March 12, 2018, Microsoft Teams celebrated its one year anniversary and what and eventful first year it was! According to Microsoft, around 200,000 organizations in 181 markets (in 39 languages) are using teams to date and we can expect it to rise throughout the year with Microsoft’s additional features and updates to Teams this coming year. In addition to this, Microsoft will be adding new enterprise-grade calling features in Teams which will include consultative transfer and call delegation and federation. Another feature that will be introduced is Direct Routing which will allow you to use your existing telephony infrastructure with Teams for calling. To learn more about this you may read the original article here or you can contact us at 893-9515 to ask us directly!